We’ve all heard those sayings that go something like, “If you don’t like the weather in Michigan, wait five minutes.” True or not, the lovely mitten state does have a tendency to be erratic with its weather patterns, and as any true Michigander knows, one should always expect the unexpected… such as a giant snow storm in mid-April, or 65 degree days in February. How does this apply to ArtPrize? 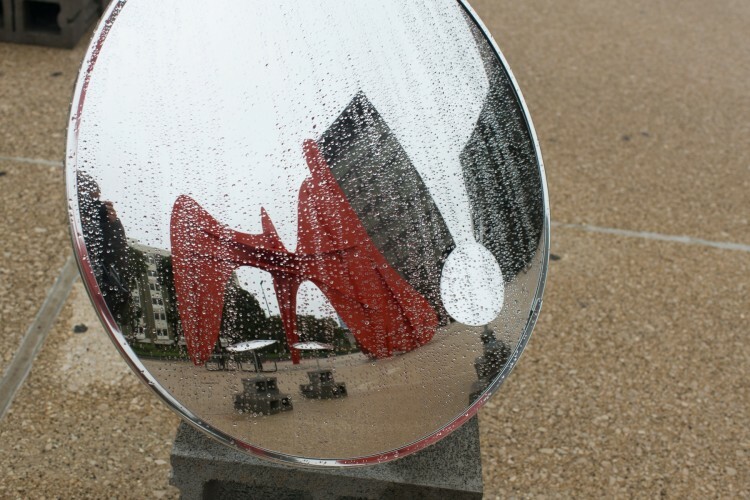 You may first think, “Yes, a visitor to the largest art competition around may get a little damp while traversing the streets of downtown Grand Rapids.” And you’re not wrong—rain is usually inevitable, and umbrellas are often needed as visitors travel along the different pathways or routes in search of finding their favorite artwork. In my case though, as an exhibitions intern for this competition, weather patterning and unpredictability played a major role in my job and learning experience. Imagine you were strolling down the walkway next to the Grand River and Ah-Nab-Awen Park, perhaps having just been at the Grand Rapids Public Museum, or the Gerald R. Ford Museum. First, you may have seen groups of school children running, climbing, and then tumbling off of the giant red crocodiles that seem emerge from the river and head toward the Gerald R. Ford Museum. This Featured Public Project was by Cracking Art, and was aptly named The World Beneath the City. The name references the recycled plastic used as a medium for the cherry red reptiles, how we as a society use and abuse materials such as plastics, and how these materials are forever a part of our world. Looking to the other side of the invasion of crocodiles, you would be hard-pressed not to notice a large dome seeming to effortlessly float atop the rushing rapids. This was not just any dome. Like the crocodiles, Harvest Dome 3.0 by SLO Architecture also utilized materials discarded by our society. 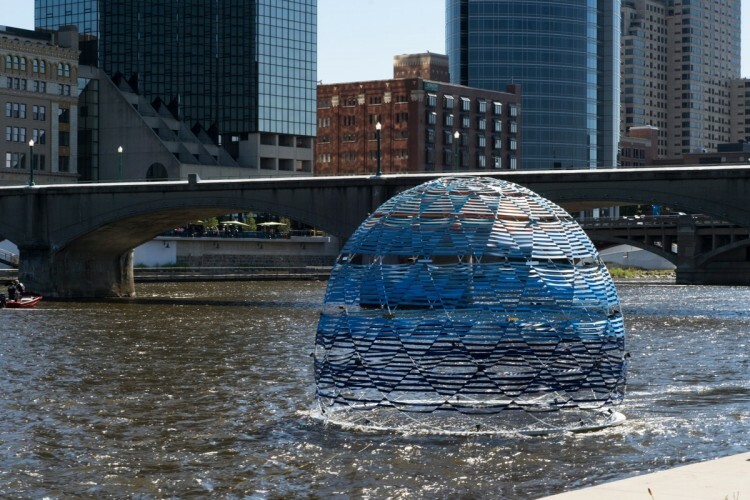 This Featured Public Project was meant to recall and symbolize the legacy of manufacturing in Grand Rapids, and the impact of the industry on the river’s ecosystems. 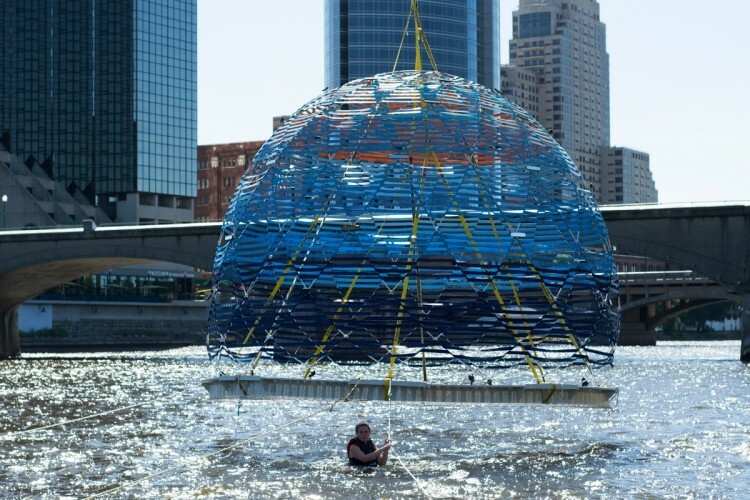 According to the artists’ statement, “the transcendent abstract form of Harvest Dome 3.0 emerges from a flotsam of accumulated materials, its bright blue seatbelt lines and sky-and-water-reflecting rearview mirrors shimmering like a bubble coming up from the surging rapids, transfiguring the river's power and possibility”. So, now you might be wondering how this structure was constructed and gently placed in the rushing water… Let me tell you. Construction for the dome began August 14 and was finished fourteen days later. I began assisting with the build about midway through, and was mostly involved in wrapping the hundreds of feet of reclaimed seat belts around the skeleton of piping that constitutes the dome’s shape. And after many hours of shaping, wrapping, unwrapping, rewrapping, and sunburns that matched the crocodiles, the dome was finished. We were set to crane the dome into the river and anchor her down… but then it rained… and rained… and then rained some more. 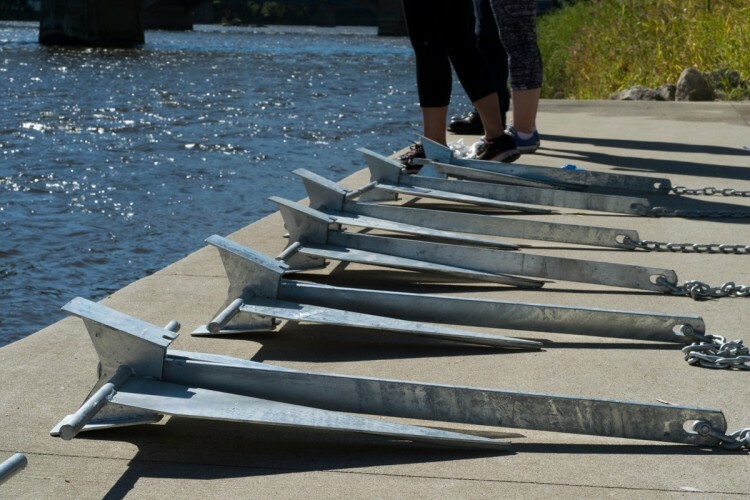 The day of install, the rapids were measuring at 4,000 cubic feet per second, and with the water at chest height this meant that our team was at risk of being swept away when trying to set the anchors. So, install was put on hold until the safety of the team was better guaranteed when entering the water. But the dome could not stay on the stage in the park, as there were concerts set to happen within a couple days. Thankfully, the team figured out how to set the dome on wheels and the next day we pushed it to the other side of the park, which went smoothly as the whole the ArtPrize team turned out to help us. Harvest Dome 3.0 made it into the river during the first week of September. We waited until the water pressure went down to 3,000 cubic feet per second, and under the watchful eye of the Grand Rapids Fire Department, our team craned the dome in, and anchored it at eight different points. While this may sound easy, it took a good portion of the day to complete. We had to carry twenty pound anchors through three feet of rushing water, attach them to the dome, and then walk them out a certain distance and try to get them to catch and hold to the river bed. 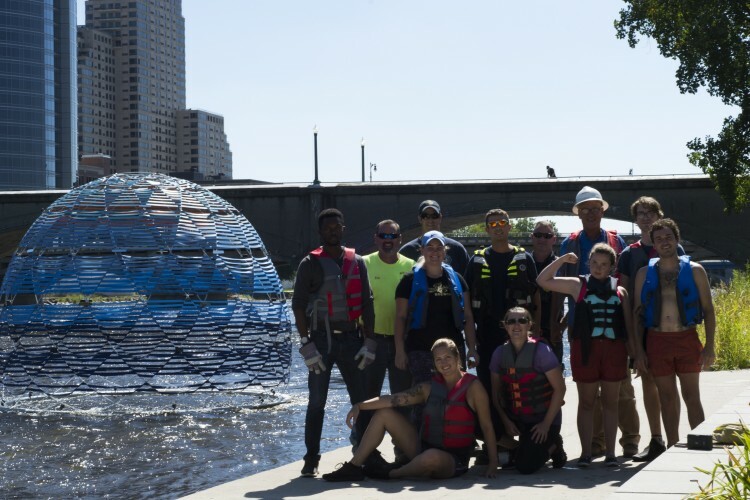 Once it was all said and done, and the dome peacefully rested along the river bank, visitors were able to appreciate the ingenuity and creativity that went into creating the piece and keeping it afloat. Another example of the hardships and coordination that go into public projects due to the unpredictability of weather and environment was evident in Stream by Gustavo Prado. 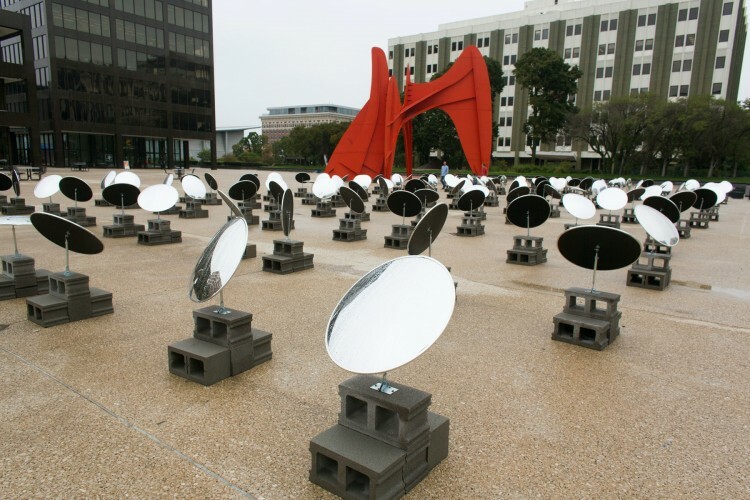 This Featured Public Project was installed at Calder Plaza, and was comprised of 128 convex mirrors that invited visitors to activate the piece—seeing their own reflections and those of others, as a way of grounding them in their location and creating an unique experience of the plaza. The mirrors were drilled into cinders blocks and strategically placed throughout the plaza, and while they seemed sturdy—they struggled against the 20mph winds we experienced on the first Friday of the event. The wind was so strong that it began tipping some of the mirrors over, even though they were attached to the heavy cinder blocks. About half the mirrors fell. To resolve the issue our Public Projects Manager and the artist reorganized the layout of the mirrors, made the bases wider and heavier by attaching the blocks together, and shortened the height of the mirrors so that the center of gravity was lowered. This created more purchase where the sculpture met the ground, and more resistance against the gusts that headed towards the open plaza. Thankfully, the incident did not result in any extreme damage to the piece due to the durable material used in constructing the mirrors. In exhibitions, we cannot rely on mother nature to be reliable, timely, or helpful. You have to be able to pivot on a dime and tailor plans to fit the situation. Flexibility and improvisation is key, and one thing I have learned is that while some may say, “what if we had done this?,” it is better to say, “What can we do to fix this?” or “What can we do to continue the upward progress of this piece/exhibition?” It’s not about what uncontrollable circumstances or events come up, but rather about how you’re able to solve the issue and move forward to better outcomes. And as an exhibitions intern, I saw the ins and outs of ArtPrize, and in the end it’s all about celebrating the art and the artists that choose to come together for this great event.